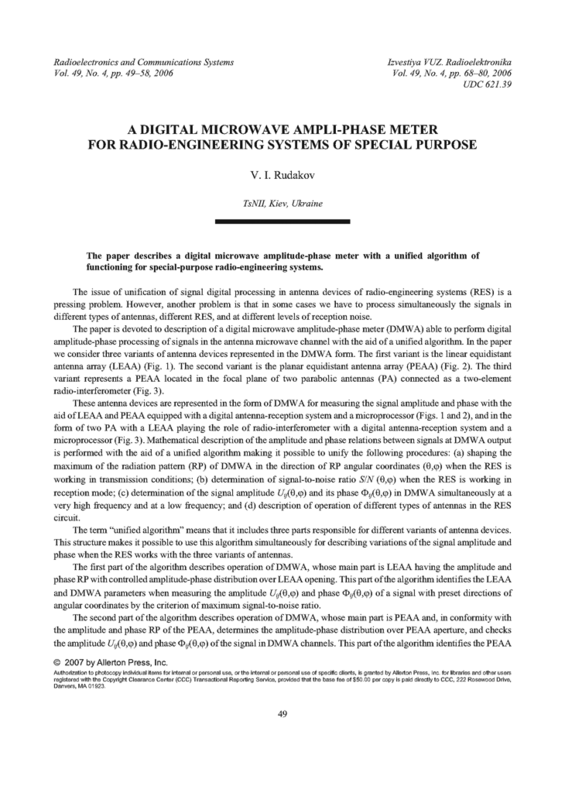 The paper describes a digital microwave amplitude-phase meter with a unified algorithm of functioning for special-purpose radio-engineering systems. BAKHRAKH, L.D. (ed.). Handbook of Antenna Devices [in Russian], v.1. Moscow: Radiotekhnika, 1997. VENDIK, O.G. Antennas with Non-Mechanical Motion of the Beam (Theoretical Principles) [in Russian]. Moscow: Sov. Radio, 1965. BAKHRAKH, L.D. ; KREMENETSKII, S.D. Synthesis of the Radiating Systems [in Russian], Moscow: Sov. Radio, 1974. AIZENBERG, A.G.; YAMPOL’SKII, V.A. ; TERYOKHIN, G.A. VHF Antennas (in two parts) [in Russian], Part 1. Moscow: Svyaz’, 1977. AIZIN, F.L. "O razdelenii signalov po napravleniiu prihoda," Radiotekhnika i Elektronika, n.12, p.2511-2518, 1972.